It is billed as the	"greatest	party	since	Camelot". 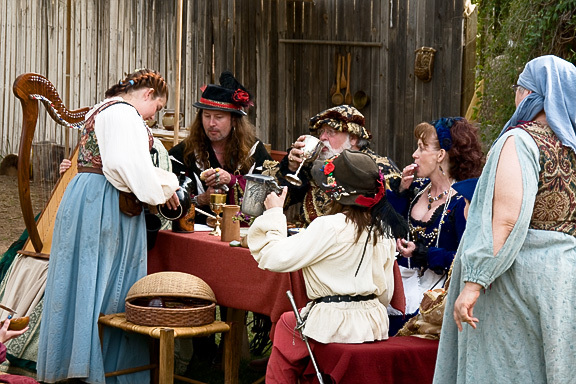 I really cannot say since I have not been to all the parties since the 14th century — but they do quite a lively gathering near Gold Canyon just east of the Phoenix metro area. 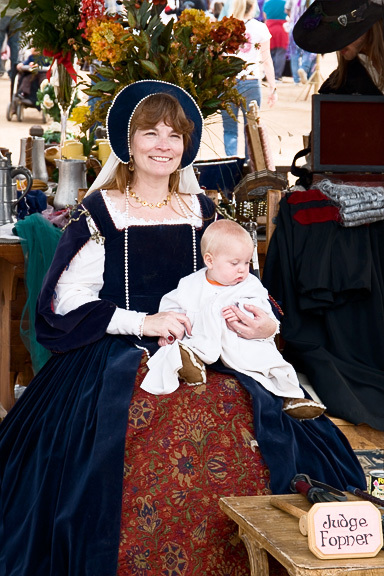 They have actually created a small village that harkens back to the times of the Renaissance and each weekend during February and March you are invited to join in the festivities. I went on President's Day and was surprised to find so many others there on the same day. There is a huge parking lot — easily as big as a stadium parking lot (do note carefully where you leave your car — there are no signs to help — I took photos of some flags and a big cactus so I would have landmarks when I eventually returned). Naturally there were long lines to buy tickets. I began wishing I had purchased my tickets in advance — but by then it was then too late. As I stood there, the people behind me asked me if I was by myself — because they had some two-for-the-price-of-one coupons but they were an odd number. So they shared one of their coupons with me and I got in for half price. Good	thing,	because	the entrance fee is just the beginning of a plot to separate you from your cash. 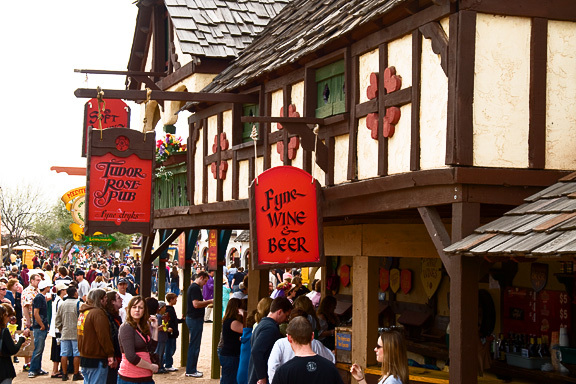 The village is full of shops selling beverages, food and renaissance-theme souvenirs. 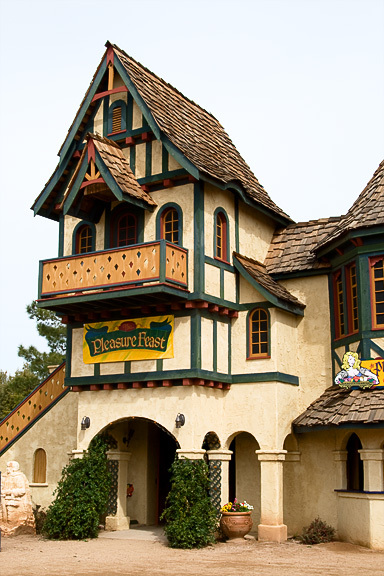 I went to the Renaissance Festival one time years ago when I lived in the Bay Area. The food item that I recall that caught my attention then (but not my cash) was the turkey legs. Of course, these things are huge (compared to a chicken leg) with a price to match. But I did see quite a few people walking around munching on a turkey leg together with some grog to wash it down. 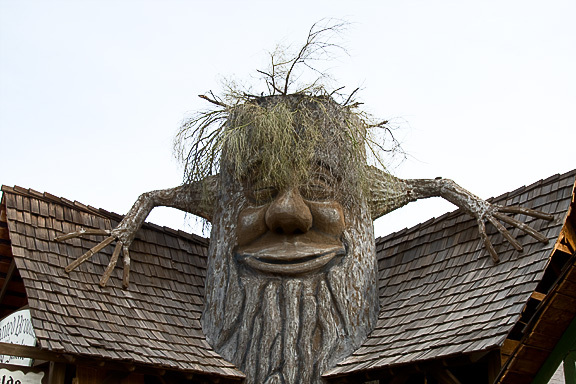 This	building	was	particularly interesting with a tree with a face growing right up through the roof. They were selling brooms. Harry Potter would have been right at home. The village is not paved and we did experience rains a couple days prior to my visit. 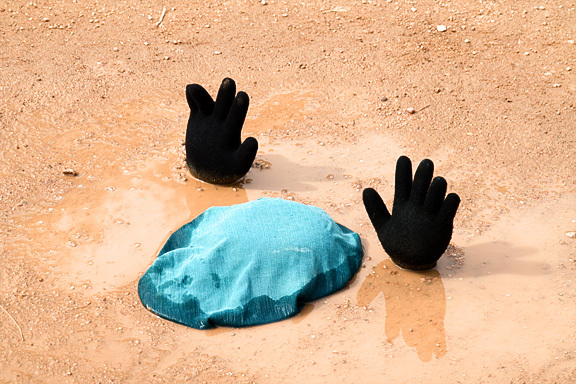 The	result	was	a few mud puddles and this poor fellow fell into one that appeared to be bottomless. 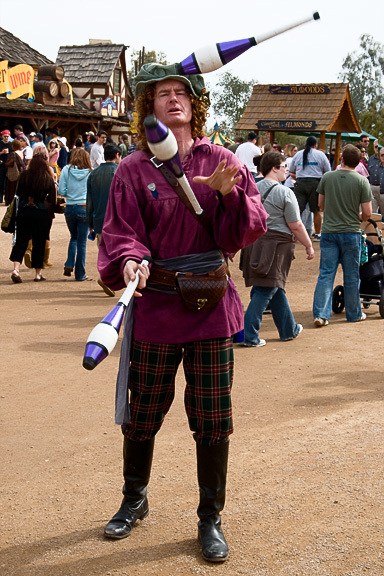 Of	course,	there	had to be a juggler. This guy claimed to be from New Zealand and was quite good. He did a little show and spent as much time with his joking patter as with his juggling. It seems that many of the cast members perform for tips — so the better the overall performance, the better the tips. 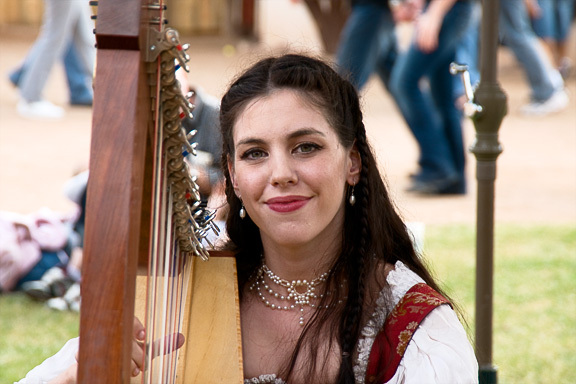 This young harpist was really quite good — and had such a pleasant smile. She really seemed to be enjoying herself and the people gathered in this shady spot seemed to be really enjoying her playing. More	music,	this time accompanying a small troupe of belly dancers. These five young women were one of the best troupes of belly dancers I have ever seen — they have obviously practiced together extensively to synchronize their dance moves. And	what	is	this? A living, moving tree? This little girl has not quite figured it out. But her parents gave her a dollar to put in the gourd in which the performer accepted tips — she tossed it in but then had to take a longer look at this thing she had never seen before. The scene was so cute and I could not have posed her better — and only had a split second to get the shot — I was lucky. Some	of	the	cast members were demonstrating old activities that were part of everyday life and which we no longer see or do. 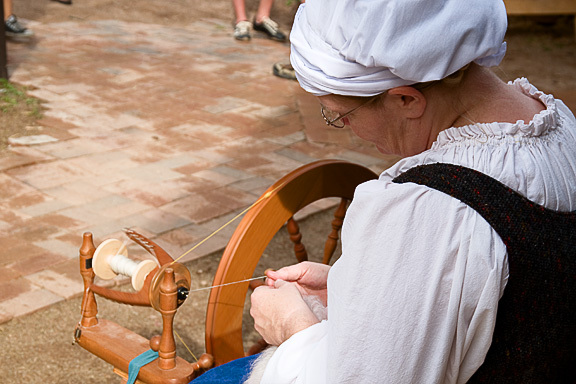 This lady is spinning wool into thread on her spinning wheel. In this day of automation, it is worthwhile to reflect on where we came from technologically speaking. And	what	a	cute scene with m'lady and her child. Of	course,	the cast members get hungry. So there was a small area set up where cast member cooks were preparing and serving food to other cast members. No, they were not serving burgers and fries but foods that could easily have been prepared in Renaissance times. There are more photos but I will share them next week. 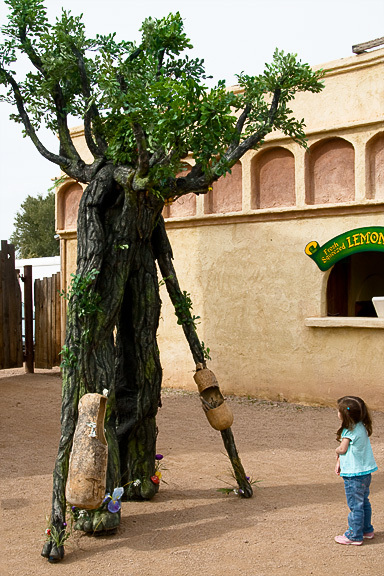 For anyone interested in more info on the Arizona Renaissance Festival, you can visit their web site by clicking here.